The donkey and elephant have long represented the Democratic and Republican Parties. But how did they choose them? Did they spend months deliberating? Was a law passed? Was there a public vote? Actually neither party set out to find an icon. The acceptance of these symbols grew out of negative comments and political cartoons. Here’s how it happened. The Democratic Party’s first association with the donkey came about during the 1828 campaign of Democrat Andrew Jackson. Running on a populist platform (by the people, for the people) and using a slogan of “Let the People Rule,” Jackson’s opponents referred to him as a jackass (donkey). Much to their chagrin, Jackson incorporated the jackass into his campaign posters. During Jackson’s presidency the donkey was used to symbolize his stubbornness by his opponents. After Andrew Jackson left office, political cartoonists furthered the Democrat and donkey connection. An 1837 cartoon depicted Jackson leading a donkey which refused to follow, portraying that Democrats would not be led by the previous president. The habit of associating the donkey and the Democratic Party had begun. The earliest connection of the elephant to the Republican Party was an illustration in an 1864 Abraham Lincoln presidential campaign newspaper, Father Abraham. It showed an elephant holding a banner and celebrating Union victories. During the Civil War, “seeing the elephant” was slang for engaging in combat so the elephant was a logical choice to represent successful battles. The elephant appeared again in an 1872 issue of Harper’s Weekly where it depicted Liberal Republicans. For whatever reason, political cartoonists and the public did not yet associate the elephant with the Republican Party. Thomas Nast is widely credited with perpetuating the donkey and elephant as symbols for the Democratic and Republican Parties. Nast first used the donkey in an 1870 issue of Harper’s Weekly to represent an anti-war faction with whom he disagreed and in 1871, he used the elephant to alert Republicans that their intra-party fighting was detrimental to the upcoming elections. However, it was his 1874 Harper’s Weekly cartoon entitled “Third Term Panic” (pictured at right) that solidified the use of symbols. Republican Ulysses Grant had been president for two terms and was contemplating a third (it wasn’t until 1951 when the 22nd Amendment limited presidents to two terms). 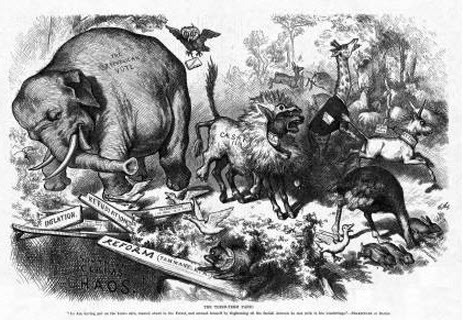 The cartoon depicted a donkey wearing a lion’s skin emblazoned with the words “Caesarism” (an undemocratic attempt to wield imperial power) frightening away an elephant wearing the words, “Republican Vote.” After this cartoon appeared, Nast used the elephant again and again to represent the “Republican Vote.” Eventually the “Vote” fell away and the elephant and Republican Party became synonymous. It’s amazing to think that an insult, a war phrase, and dry humor influenced the symbols which came to represent two of the most powerful political parties in the world. 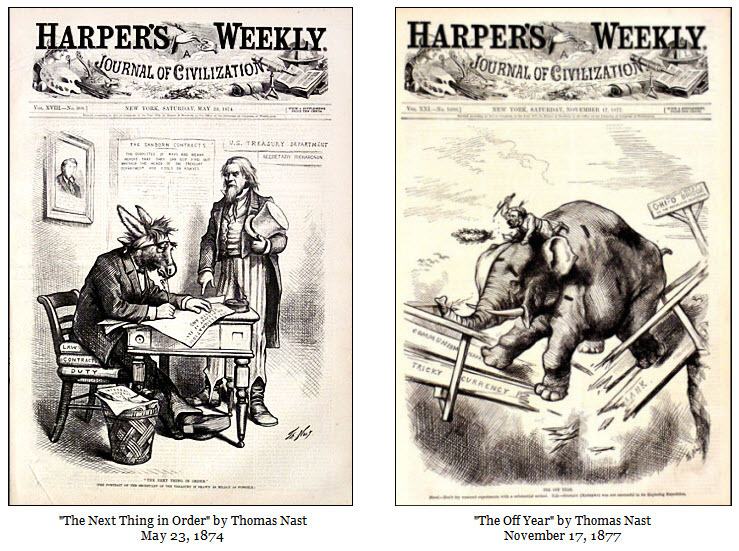 Below are two additional cartoons that include the donkey and elephant created by Thomas Nast, both of which were featured on the cover of Harper’s Weekly. Read more about Thomas Nast, take a look at a portfolio of his cartoons, and review questions in the teacher’s guide on the Cartoons website created by the Ohio State University Libraries at: cartoons.osu.edu/digital_albums/thomasnast/. What positive and negative traits do donkeys have? What positive and negative traits do elephants have? Do you think the donkey and elephant were the best choices to represent the Democratic and Republican Parties? Why? Why not? What animals would you have picked and why? What kind of animal best represents you? Why? Do you think political cartoons influence readers? How so? Would a cartoon change your mind or just make you aware of the other side of an issue? Are political cartoons a good use of Freedom of Speech? Research how the Democratic and Republican Parties came to be. The first political party called themselves Federalists. Visit your local library to learn more and also read “Choosing Sides: The Rise of Party Politics.” Discuss the following questions: Why was the first party called the Federalists? What did they stand for? What party came next? What did they stand for? What did this next party change their name to? What happened to the Federalists after the War of 1812? Who became the Whigs? How did the Republican Party get the name Grand Old Party? What are the differences between our current Democratic and Republican Parties? How many of our Presidents were Democrats? How many of our Presidents were Republicans? Divide the class into two groups-Democrats and Republicans. Have each group research their party to determine the basic platforms and the names and dates of their party’s presidents. Have each group present its party’s core beliefs. As a class, draw a time line of our presidents, identifying each party. Have we had more Democratic or Republican presidents? Our nation has had other political parties in our history. What were they? Did they have mascots or symbols to represent them? Do you think the symbols were accurate? Divide the class into three groups and give them a century to research (1800, 1900, and 2000). Identify each party, what it stood for, if it had a mascot, and how that mascot reflected the party’s beliefs. Elephants are native to Asia and Africa and donkeys were brought here by explorers. Have the class study animals that were native to America in the 1800s and come up with two that best represent the Democrats and Republicans. Discuss why each was chosen and how its characteristics reflect the Democratic and Republican Parties. Anderson, Dale. The Republican Party: The Story of the Grand Old Party. Minneapolis: Point Books: Compass Point Books, 2006. Paine, Albert Bigelow. Thomas Nast: His Period and His Pictures . Charleston: Nabu Press, 2010. Sabato, Larry and Howard R. Ernst. Encyclopedia of American Political Parties and Elections. New York: Checkmark Books, 2007. Sperber, Hans and Travis Trittschuh. American Political Term: An Historical Dictionary . Detroit: Wayne State University Press, 1969. Wayne, Stephen J., et al. Conflict and Consensus in American Politics . Stamford: Cenage Learning, 2008. Adler, John. HarpWeek. 2008. 5 August 2012. Kennedy, Robert C. NYTimes. 2001. 5 August 2012.